10.29.2003 - I caught this mouse in a cage today. The customer had a problem with scratching noises in the attic, running and scampering noises at night, in the walls and ceiling. I was called out to investigate. When my inspection of the attic yielded a mouse infestation, the customer seemed crestfallen. "I don't want to kill the mice!" she said, "can't you just use some sort of mouse repellent?" I told her the truth, that there's no such thing as an effective mouse repellant. Many are sold online, and most of them consist of some sort of flakes or powder, most likely composed of mothballs or doused with animal urine. While these products don't smell very good, they also don't work. I've already worked in an attic that contained 50 pounds of mothballs (ten 5-pound boxes), and it reeked up there, but the scent did nothing to drive the rodents out, and it only gave the homeowner headaches. Because there's no such thing as an effective repellant, I did what I always do - I solve the problem for real, and permanently at that, by finding and repairing all the open spots on the outside of the house that rats and mice can use to gain access to the attic. Once that's done, the majority of the problem is solved. It's then usually a matter of setting snap traps in the attic, which are by far the most effective (and most humane, in my opinion) means of catching the rats or mice. But for this particular customer, I set six cage traps in the attic. It's harder to set cage traps, because I'm more limited in the nooks and crannies I can set them, the tension on the trip pans must be just right, and cages are less effective. In addition, a mouse in a cage can't be left alone for days on end, starving, dehydrating, or getting heat stroke in an attic. 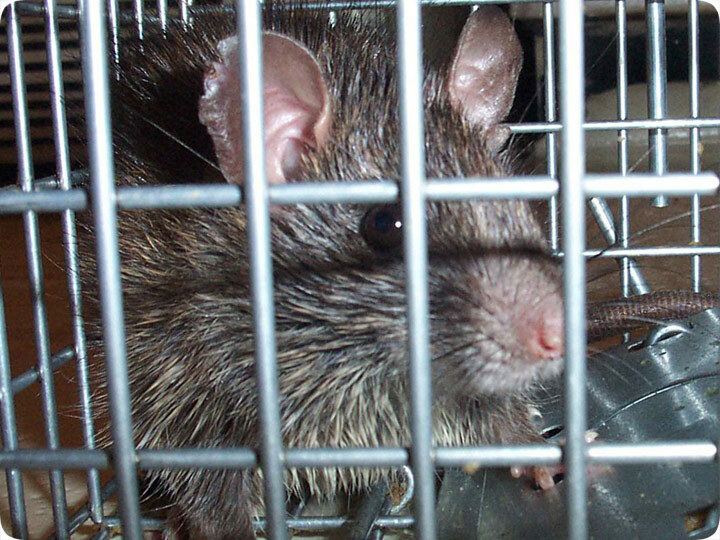 Whereas snap traps can go unchecked for a few days, cage traps must be checked every day, at an extra cost to the customer. She agreed, and I checked every day, and sure enough, I caught the mice in the traps, as shown in the above close-up photo. After a few more days and no more fresh catches, the job was complete, and her mouse problem solved for good. She could have applied all the mouse repellants in the world to her house and attic, and it wouldn't have done a lick of good.